Are you ready for a weekend underwater adventure? Then, take a plunge into the most sought-after diving destinations in Anilao, the so-called “birthplace of scuba diving” in the Philippines. 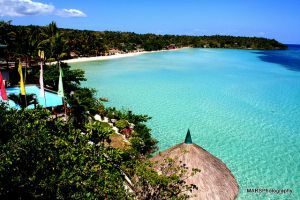 A marine protected sanctuary, Anilao is located in the coastal town of Mabini, Batangas, in South of Luzon Island. It is approximately 140 km. away from Manila, just a 2.5 to 3-hour travel by land. 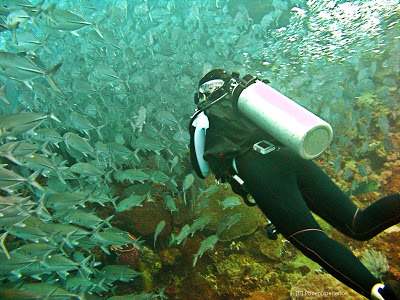 Apart from being a spectacular holiday destination, Anilao also has a thriving underwater scene. It is close to Verde Passage, dubbed as “the Center of the Center of Marine Shorefish Biodiversity in the world.” The proximity to the metropolis makes it a great diving destination during weekends and day tours, making it popular not just in the country, but also in the whole world. Teeming with marine biodiversity, the town has more than 40 dive sites with about 5 to 30 minutes apart from any resorts. Diving sites include the Cathedral, Eagle Point, Coala, Coala Aquarium, Arthur’s Rock, Twin Rocks, Mainit, Mainit Bubbles, Bahura, Bahura Corner, Layag Layag, Layag Layag Bahura, Kirby’s Rock, Bahay Kambing, Caban Cove, Bethlehem, Darilaut, Sepoc Wall, Sepoc 2, Sombrero Island, Beatrice 1 and 2, Aphol’s Point, Grotto, Bonito Island, Light House, Devil’s Point, Mapating, Vistamar, Basura, Drive and Trek (Cavern and Lobster Hole), Ligo Island, Ligpo Cavern, Batalan Rock, Agahuta, Red Rocks, 3’s Cuevas, Dead Palm, Secret Bay, Anilao Pier, Sunview and Sammy’s Point. 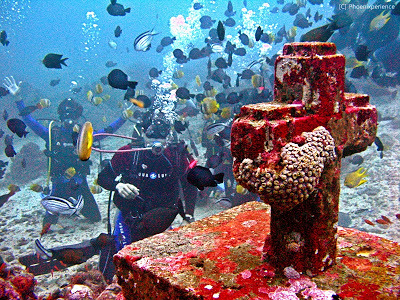 Anilao gives divers of every skill level the chance to see the underwater kingdoms and marine life surrounding the beautiful islands. 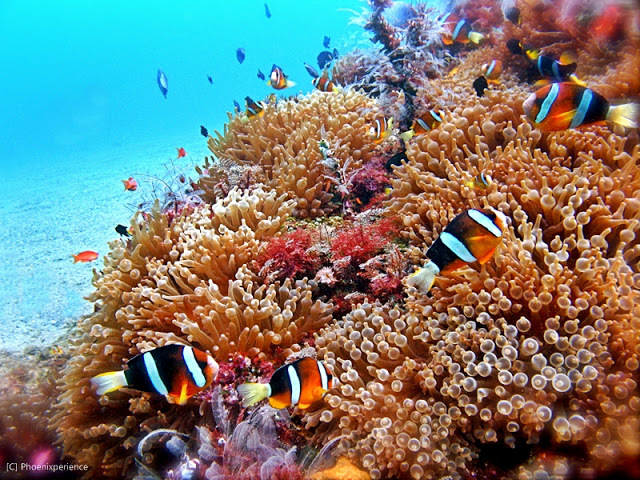 It is where you can see different species of corals, and rare-to-find critters and gigantic pelagic fish. Among the attractions you may encounter in the underwater ecosystem of Anilao are fish feeding, snappers, sharks, giant clams and pinnacle rocks. You can also find volcanic sand, coral garden and a big wall of rocs. 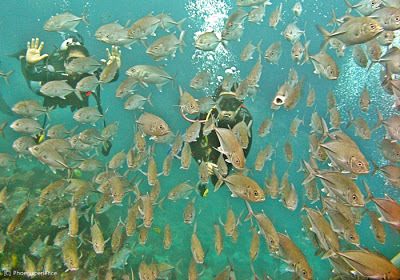 There are numerous dive resorts in the area that can provide all your scuba diving needs. Most of them have their own swimming pools that are intended for scuba diving lessons and for recreational purposes. 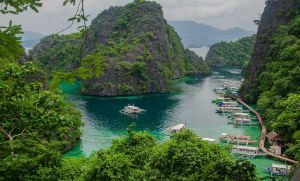 The Vistamar, Planet Dive, Pier Uno, Anilao Outrigger, Aqua Reef Venture Portulano, Dive Resort, and Acacia Dive Resort are best known in the place for their affordable diving packages. For public transportation from Manila — catch a Jam Liner, Tritran or ther bus that is bound to Batangas City in Buendia or Cubao and get off at Batangas City Bus Terminal. From there, take a jeepney ride to Mabini that will stop over Anilao Port. Finally, hire a tricycle to bring you to your chosen resort. Buses with trips to Batangas City usually leave Buendia every hour, 24 hours a day. It will take two and a half hours to travel from Manila to Batangas during off peak hours and at three to four hours during day time and rush hours. For any traffic conditions if you are coming from Manila — enter the South Luzon Expressway (SLEX) from Magallanes or Alabang Muntinlupa, then exit to Balagtas, Batangas. Go to Star Toll way then exit at Diversion Bauan exit Rotonda. Then, proceed to Bolbok diversion road until Fly over. Turn right going to the town of Bauan, Batangas. Do not go to Batangas pier. Proceed to Bauan Market, then Manghinao Bridge. Turn left going to the town of Mabini, Batangas. Pass by AG and P of San Roque. Head to barangay of San Juan, Zigzag Hospital and Mabini’s shrine or statue (Now New Tourism Triangle). Finally, turn right to Anilao. So when you’ve had your fill of pristine white beaches, head underwater and take part in one of Anilao’s exciting underwater activities.